Master in train gets scared seeing a ghist TC at gunnor station. Angoori in garden, Vibhu greets her, Angoori greets her back, Tiwari comes and teases him, and says anyways i need help will you help drop a parcel of my stock in gunnor, vibhu says im not delivery boy,both get in argument, Angoori asks them to calm down, and says let me talk, and requests vibhu to deliver the parcel, vibhu says just because you insist but final rate 3000, Angoori says okay, Tiwari says shutup 1000, vibhu says 2000 final, Angoori says agree to his offer or i will call amaji,tiwari agrees and says if you misplace it you will have to pay me 50000. Angoori says to vibhu i will leave now, Saxena and Gupta walk to them,saxena says this is my new device to find ghosts and souls, Gupta says we wont find anything here let’s go cemetery. Meenal and Anurag visits Anu, meenal says im here to take you with me,you are our football team captains,anu says im injured, Meenal says learn something from me to control like i do with Anurag, Anu says actually vibhu and anurag are different you see, meenal says anyways i was thinking you cant play be our motivational coach, groom my team members,by i have to find new captain. Boys at tea stall, teeka asking stupid questions, vibhu joins them,malkan asks did you have haldi ceremony when you got married, Vibhu says you have no work all day timepass, tilu says look who is talking,malkan says where are you going with this parcel,vibhu says gunnor to deliver Tiwari’s parcel, teeka says we have been many times free without ticket fooling TC, vibhu scolds them and slaps them. Vibhu in train, he talks to fellow passenger reading novel, and asks whats the topic ,he says horror novels, im found of them,i have read all of them, Vibhu says okay i get it, but have you seen any in real, he says no thats the problem,i have never seen any, Vibhu says i will pray you see one. Vibhu starts missing angoori and sees her photo in her mobile, he sees a station approaching and decides to have tea. Vibhu gets off the train, and finds theres nothing on the station and asks a TC why is there no tea stall,TC says how could you travel without tickets Vibhu finds its a ghost TC,and rushes towards train,vibhu gets in the train scared,vibhu starts acting weird. Angoori and Tiwari open the door late night and find amaji, Angoori asks why so late, ama says first tell me why are your phone’s switched off, Angoori says he did so that no one disturbs us, Ama scolds Tiwari, tiwari asks what was so urgent, Ama says pandit Rampal called you two are gonna face lot of hardships. Pre cap: tiwari and Vibhu drinking, vibhu turns ghost. 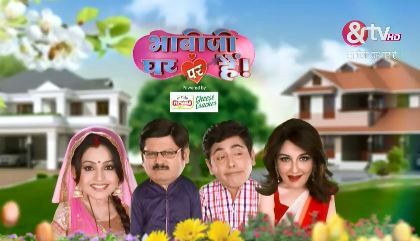 The post Bhabhi Ji Ghar Par Hai 11th March 2019 Written Episode Update Mystery of Gunnor station appeared first on Telly Updates.